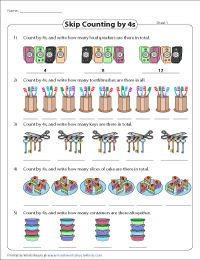 On this page, worksheets based on counting with objects, number lines and many more activities are available. Besides, it contains fun activities like mazes and connecting dots. 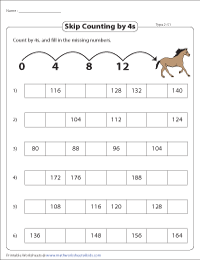 Practice skip count by 4s with these printable worksheets. 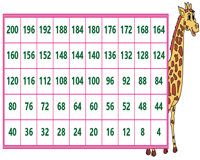 The display charts provide a visual treat to learn skip counting by 4s in a creative way. Practice skip counting with partially filled and blank charts. Hone your skills in backward skip counting by 4s. Utilize the partially filled and blank charts available here to test skills acquired. 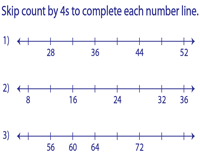 Fill in the missing numbers on the number lines. There are two levels in this section. Have fun with counting numbers in 4s with objects. Fill in the numbers to find out how many are there in all. 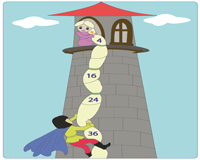 Help the Prince climb the tower and scuba diver reach the pearl oyster. Skip count by 4s to complete the tasks. Teacher templates are also provided. 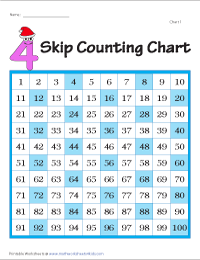 Skip count by 4s to fill in the missing numbers. 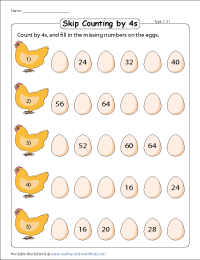 An egg theme is used with five problems in each worksheet. The horse gallops by 4s'. 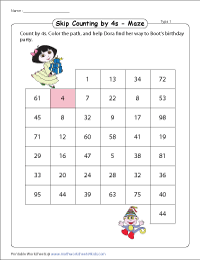 Fill in the missing numbers to complete the pattern. 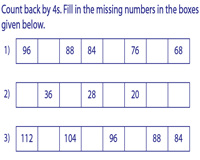 Fill in the missing numbers by count back in 4s. Each worksheet consists of seven problems. The range varies from 4 - 120. A collection of fun mazes with various scenarios are encompassed in this section. Find the path by skip counting in 4s. 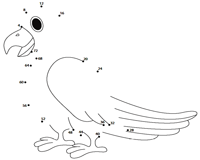 Reveal the hidden picture in the connecting dots worksheets by skip counting in 4s. Join the dots to find the picture.